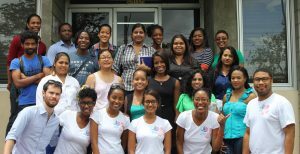 The Trinidad and Tobago chapter of the JET Alumni Association was unofficially formed in 2013 to encourage former JET Participants hailing from our Twin Island Republic to support each other during the cultural, emotional and often times career transitions many of us often have to deal with. Our community was built organically and we have seen it grow each year. Our support also extends to prospective JET participants who are often excited and eager to learn about and apply to the JET Programme. Before becoming an official chapter, we held several JET events. These included panel discussions in conjunction with The University of the West Indies, St. Augustine, hanami picnics for new JET participants and welcome back dinners for returning JET participants. Upon seeing our dedication towards formulating our own alumni association, and planning our own events, the Japanese Embassy decided to offer their support and interest in us as a resource. One way they went about this was to invite us, the local JETAA, to be represented on the interview panel for the new applicants. After Prime Minister Shinzo Abe’s visit to Trinidad and Tobago in 2014, we were pleasantly surprised to notice a marked increase in accepted JET participants from Trinidad and Tobago. We saw this as a great step in the right direction as other countries have seen a decline in accepted JET participants. We are grateful! Our Facebook page is forever buzzing with activity. Whether it’s persons sharing their experiences dealing with reverse culture shock, information about job opportunities, stories of our endless cravings for ramen or takoyaki or even bidding farewell to a few of our alumni members as they return to Japan, there’s always something happening. The topic that constantly remains on our fingertips though is the love we have for Japan, the country that we all once called home. Currently, our committee has been working on ideas on how to promote the JET Programme and Japanese culture in T&T on a bigger scale. The Committee that keeps the chapter running for JETs leaving and returning to T&T. This group is our Extended Committee. They keep the Head Committee informed of changes on the JET Programme as well as promoting the local chapter among the returning T&T JETs in Japan. They are all currently based in Japan. Any Trinidad and Tobago national who has fully completed their contract without issue, is eligible to become a member and can volunteer for a position on the committee pending a vote. Contact us via email or FB.